Things have been busy over here at Sparkle Ball central. 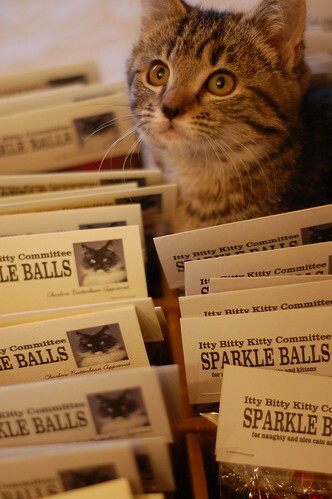 Fortunately, we've got a crack staff to insure only the finest of Sparkle Balls are shipped to the kitties around the world. Bess is inspecting the latest batch of Sparkle Balls. What do you think, Bess? Are they up to snuff? I'm afraid this batch won't do. They're obviously not sparkly enough because they're not catching Wee Willard's attention. SEND THEM BACK! And what about these, Bess? These all pass the test, and I see they have been approved by Charlene Butterbean, who has even higher standards than we kitties do. They're perfect! Send them out!!! Did you hear that, Monroe? Pack 'em up, and send 'em out! Sparkles Balls have been flying out the door at a crazy pace. We're running low on the holiday colors, so if you want to put some in your kitty's stocking, please place your order soon! Click HERE to visit the IBKC shop. 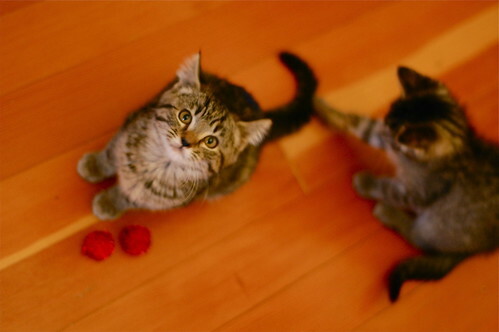 Kittens are usually more like a "staff on crack" than a "crack staff!" 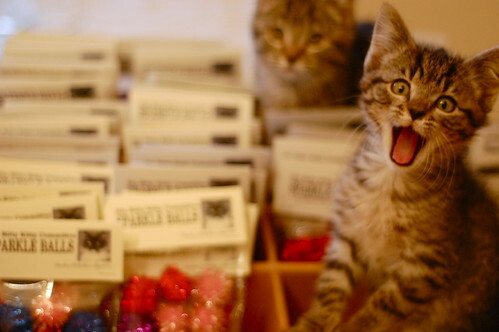 OMG - how cute are your shipping assistants???? 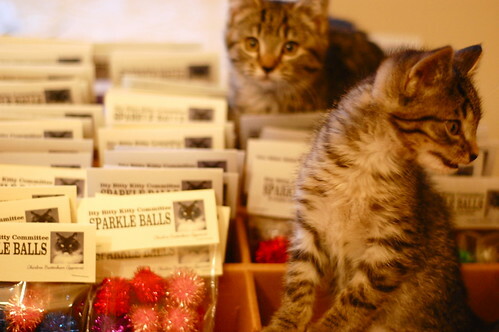 I don't even have a kitty and this post is making me want to buy sparkle balls! That is the power of the Trimbles. I love that Miss Bess is the supurrvisor of Team Trimble! 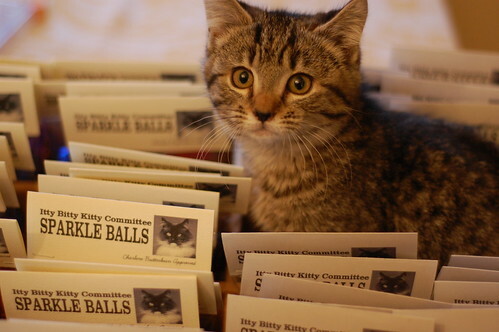 I'm so glad the adorable Trimble Tabby Trio is getting some important business experience to add to their itty bitty resumes! I hope all three Trimbles end up in the same forever home. I second that, Chee Wai Lee....too bad it can't be my house ;o) What a cute picture story, made my day!! Our babies love their new sparkle balls and send their thanks to Charlene, Monroe, and Bess for all their help with the testing, sorting and shipping. These kitties are too cute! :) Aaaaiiii! Well, thank goodness this bitty batch is so professional (Melissa, you crack me up! ), because Maren and Spenser are thoroughly enjoying their new Sparkle Balls. In fact, it looks like a Sparkle Storm in our living room.